This year, you are invited to join the great conversation of literature. Down through the ages - from Moses to Tolstoy, from Plato to Dickens, from Shakespeare to Stevenson - the most thoughtful and insightful men and women of each era have committed their ideas to paper for the world to consider. The most significant people of every culture and age have responded to those writings and ideas that resonated through the pages from the generations before, and so the Great Conversation comes to you today. ﻿﻿﻿﻿﻿﻿ The complete Introduction to Literature course contains the following ten units: Intro to Lit. Analysis, Treasure Island, Julius Caesar, Christmas Unit , The Chosen, Great Expectations, The Importance of Being Earnest, The Old Man and the Sea, Dr. Jekyl & Mr. Hyde, and the Famous Speeches & Poems Unit. Together they comprise a well-rounded year of study! Unit 1 begins with the basics of plot structure and literary vocabulary. Using short and juvenile fiction, students are guided through readings designed to help them transition into thoughtful readers. Each unit thereafter analyzes classic works with the goal of continuing to look at overall structure while honing in on one facet of analysis. Each unit includes weekly video lecture, discussion starters, weekly reading comp quizzes, vocabulary units with weekly games or activities plus a unit vocab quiz, writing prompts to encourage readers to respond to the literature, and group activities to help your class or book club get the most out of these foundational classics! The one year course subscription is $200 per student. If you plan to lead a class or club and have six or more students signing up, email me for a special discount for yourself. :) There is also a teacher/parent guide with quiz keys, guidelines for discussion questions, and a solutions manual for the grammar and composition pages. The 30 total video lessons will allow several weeks to watch full-length productions, to work on or share written responses, or to take the semester finals (a semester final is supplied at the end of Unit 5 and Unit 10). We suggest a total of 32 ninety-minute class meetings, but the class can easily be altered to suit schedules ranging from 30 to 36 meetings. The teacher's packet for the course will include suggestions on how to structure your meetings to fit your schedule. Unit 1 introduces literary analysis and purposeful reading through short fiction and children's fiction. Diagramming story elements, common literary devices, and the importance of characterization, setting, and background development are introduced. Using short works, one work will be read and discussed in class, and one will be assigned for homework (and reviewed the following week). ​This unit forms the foundation for each succeeding unit in the course. Unit 6 features a Dickens classic, Great Expectations. Pip's journey to adulthood is traced through the scenes of this novel, providing ample opportunity to closely scrutinize the importance of context, structure, and style as they elucidate the theme of this work. Dickens' style can be a challenge, but the broad appeal of the main character and his plight reward the effort! 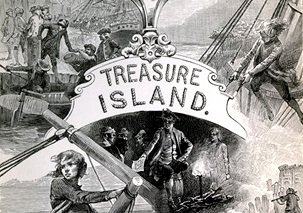 In Unit 2, we take a close look at the competing characters of Treasure Island. Treasure maps & pirate gold make this an enjoyable, accessible tale. The lectures center on details of the work, discussing its structure and style, and investigating the themes raised by the work in light of its context and authorship. Introducing the characteristics of a bildungsroman novel and applying the analysis skills learned in Unit 1 round out this unit. Unit 7 is a short unit introducing the idea of social commentary through satire. 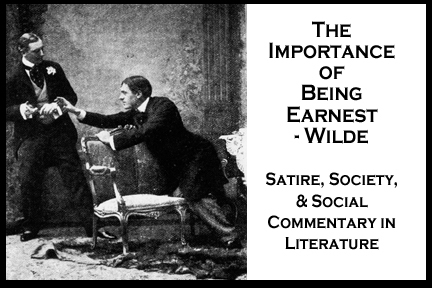 Students are at first baffled, then amused, and finally delighted as they unlock the riches of this Oscar Wilde gem. As a play, it provides ample opportunity for participation and multi-media exploration. As literature, it provides inexhaustible opportunity for analysis - and fun. Unit 3 includes a study of rhetorical modes of persuasion. Ethos, pathos, and logos are on full display in this classic work. In addition to an introduction to Shakespeare, this work serves as our introduction to the uniquely participatory genre of the play. Multi-media experiences are suggested in the course to bring this unit to life for 21st century students. In Unit 8, we will examine three short works of fiction: Richard Connell's A Dangerous Game, Ray Bradbury's A Sound of Thunder, and the short novel The Old Man and the Sea, by Ernest Hemingway. Through the works of these three acclaimed authors, we will examine characterization through plot, techniques of style, and the effect of context upon theme. ​Unit 4 explores the critical importance of the elements of setting and background as well as their use to convey theme and inform character in The Chosen. This is at once the most modern and the most ancient of the works we will study. Students will examine the methods used by the author as he seamlessly introduces the reader to the deep background story behind this tale, leading us to discover it as the main characters do. Lecture will also introduce the myth of the "neutral text" - sometimes known as worldview. In Unit 9, the Robert Louis Stevenson classic Dr. Jekyll and Mr. Hyde will be explored, with emphasis upon the authorship and character motivation. Contrasting with the rollicking youth tale Treasure Island, this Stevenson work is explores more serious themes. One common element the two share? - Detailed character development and exploration of theme. We'll take a look, carefully explore the uniquely presented time sequence and perspective along the way. Unit 10 provides a chance to bring all we have learned about literary devices, context, and style to bear in close readings of Abraham Lincoln's Gettysburg Address and Martin Luther King Jr.'s I Have a Dream speech. In addition, we will complete our poetry intro by examining three of my favorite poets: Robert Frost ("The Road Not Taken" & "Stopping by the Woods on a Snowy Evening"), Walt Whitman ("O Captain! My Captain!" & "I Hear America Singing"), and Emily Dickinson ("Hope Is the Thing with Feathers" & "A Bird Came Down the Walk").